When you lack the money to tackle a multi-million-dollar library makeover, try a measured approach. In April, the University of Louisiana Monroe's Library will celebrate its 20th anniversary. In library years, that's a long time. Called the "jewel of the bayou" when it first opened along a distinctive wetland, by 2019 the five-story structure definitely needed an update, if only because the way people learn has evolved. As Library Director Megan Lowe explained, back when her facility was built, libraries were "regarded as repositories of information; librarians were gatekeepers of information. Now we're more about facilitating access and supporting the learners, supporting the researcher. That takes a lot of different forms. Not just connecting reader to book anymore; it's connecting a user to resource or user to service, and therefore we have to change." About 16 months ago, the university hired Thomas Hoover as chief information officer and dean of the library. Almost immediately, he, Lowe and Chance Eppinette, information technology director, took a "road trip" together. They visited five different institutions in the southern part of the state to look at what other libraries were doing. Their goal: to turn the current facility into a "digital commons." Now their vision is starting to come to life — on a single floor. Their approach, however, of working with students, finding common interests between the library and IT and coming up with that certain "something" that highlights the uniqueness of the facility, will stand them in good stead as they remodel their way through the rest of the building. For the last couple of years, the team has been setting up collaboration study rooms among the five floors of the facility, where, as Eppinette explained, "anywhere from three to 10 students can reserve a room and gather with their partners and utilize touchscreen AV technology." Usage of those rooms among students proved popular and delivered the "kickstart" for the expansion of technology throughout the library. Now, Eppinette noted, "We're moving those four study room walls out; we want them to still have that collaboration, but they're doing it in an open air space." By "open air space," he specifically meant the second floor, which was left empty after a "deselection" process had eliminated about half of the library's physical book collection. What the trio imagined was a space that would be "fun to be in, comfortable," with different "zones," such as a computer lab spread out in various configurations and collaborative spaces where students could be "alone but together." In other areas, tall bistro tables would invite patrons to make quick stops for checking e-mail or wheel over a whiteboard or two and collaborate on projects. When Hoover, Lowe and Eppinette came back from their library tour, they spent time "dissecting" what Hoover called the "good, the bad and the uglies" to create a plan to take to the student government association. That only made sense since the SGA was backing the use of student technical fees for the makeover. Those students were a big part of the decision-making. A student committee of eight, each person representing a different academic area, college or department, advised throughout the planning. Before the purchase order was put in for the new furniture, for example, the trio held an open forum for four hours on the second floor, provided cookies and punch and walked students through a presentation on what the newly redesigned floor would look like. "We wanted to make sure there were no surprises," said Hoover. "We didn't force it down their throats. Involving them in the process early is key." That's also important for another reason: Having a place people frequented would feed directly into student success efforts. "All the statistics and evidence show that the more students are on campus — whether it's work on campus, homework on campus, live on campus — the better off their grades are," explained Hoover. "We've really tried to create this to be a hub where our students want to hang out, because we know the more they're here, the better off their grades are going to be." Of course, not everything the students wanted (24/7 operations?!) was possible. "But where we can be reasonably, meaningfully responsive, we want to be," added Lowe. According to Eppinette, the current student tech fee is $60 per semester. That totals just under a million dollars a year. The library also kicked in some reserve money, which Lowe as library director considers a worthwhile investment. "I think it makes perfect sense," she said. "The library and IT really have to work together to create the resources that our students need to carry out their learning and their research. If the computers aren't great, then the students can't really do what they need to do. If they don't have powered furniture and technology-equipped spaces, all of our databases don't mean as much. We also have to anticipate the digital divide that a lot of our students are coming in with. We have to ensure equity by equipping these spaces with technology that they can use. So this is how the library supports that, by kicking into the kitty." The biggest sparkle in the jewel could well come from the virtual reality lab, a space outfitted with 28 Oculus Go headsets and 28 high-end computers packed with the components for the intensive graphic rendering that VR requires. The room also has three HTC Vives with wireless adaptors as well as three sets of VR gloves, which allow the wearers to have tactile experiences too. An instructor machine will be hooked up to two large monitors at the front of the classroom to let students see what the professor wants to show them. And an additional large screen will set up outside the room, so that people who are in the library for other reasons can see what's going on in the VR classroom. Recently, the library hosted an orientation, working with 20 faculty members who will be part of the initial group of instructors using the space. During that event, participants experienced what it was like to travel through the human body and were taken on a 3D tour of the new medical school being constructed on campus (captured with a 360-degree camera). The IT and library crew hopes to treat the room like a chemistry lab, said Hoover. Students will come in for regular classes, and there will be drop-in hours. Currently, the team is sifting through the proposals from that initial group of faculty who tested the equipment. They plan to select "five, six or eight" ideas and work with those instructors on integrating VR usage into their classes for the rest of the semester or as part of "onesie-twosie" uses. On the roster are courses covering geography, computer science, biology, education and speech pathology. Along with campus-specific uses, the university also expects to do outreach to the community in northeast Louisiana, allowing area K-12 students to come in and get VR experiences through tours created by Smithsonian and other sources. The lab attaches to a room where a MakerBot 3D printer is set up, along with a small set of Macintosh computers. Students will be able to design objects with the VR setup and then send those files to the 3D printer for production. Hoover is hoping that other prototyping printers on campus that are underused will make their way to that area to create a farm of 3D printers for broader use. To help faculty learn how to exploit the new gear, the university is in the process of hiring a director of instructional technology. An existing Moodle group on campus has been repurposed and additional staff added too as part of setting up a dedicated instructional technology unit. Early on, the university circulated a $9 million proposal to redo the library from the ground up. A lot of the funding would have gone to construction matters — adding rooms, changing vents for HVAC and related details. What Hoover, Lowe and Eppinette tried to accomplish was a redesign that didn't require any structural changes on the building at all. "We were very deliberate in that," said Hoover. "I started off most meetings by saying, 'You know what, we didn't win the lottery — but we do have money.' We're not going to have all the furniture in the world. We're going to do one floor at a time, and it might take two or three years. But this one floor is going to be nice. And then we're going to see what works well and move to the next floor." Manage expectations. "We had a much bigger vision at the beginning," said University of Louisiana Monroe Library Director Megan Lowe. "We've had to scale back and that's been OK. I don't think any of us have treated that like a failure. It's just being able to adapt to what our resources are and what our spaces are and what our students want and need." Pilot. Do not get overly excited about buying a whole bunch of new things and putting them out there, because "if you do that, you may be wasting money," asserted Lowe. In terms of furniture, that means getting and testing one piece of a "certain type of large furniture" and two or three pieces of smaller components, such as the study-alone units the library added. Choose vendors with education experience. As an example, Herman Miller has invested a lot in understanding libraries," explained IT Director Chance Eppinette. "They also do furnishings for businesses and hospitals; but they try to design this furniture so that it's functional and robust to how a student would use it." Get creative with funding. State financial support for universities in Louisiana hasn't been "friendly," said Thomas Hoover, CIO and dean of the library. So, the team has scrounged funding from several sources. The president, for example, came up with the budget to cover new carpet and painting for the second-floor project. And additional money has been freed up for the remodel by becoming more efficient with IT operations — "tightening the screws down," as Hoover put it, such as with remote monitoring of labs to replace student workers. Settle in and survey. Before rinsing and repeating, make sure the new layout works with users. 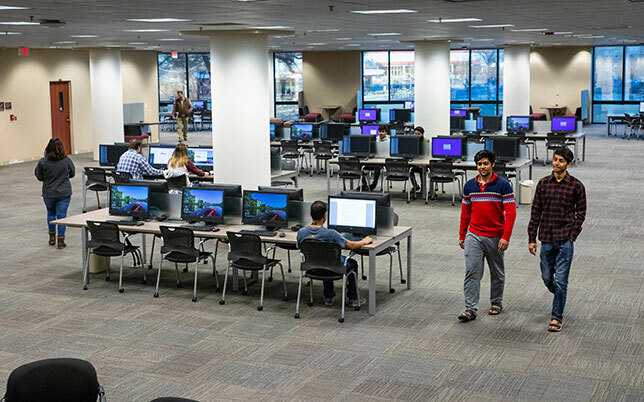 Hoover said the library will soon survey students and faculty for feedback on their second-floor likes and dislikes before moving on to next steps. He's already got surplus carpeting from the latest remodel that he thinks will cover the first floor. And then in the next fiscal year, it'll be time to start over.